The Maroon Bells are probably the most photographed peaks in Colorado so when I decided to do a painting of them, I was pretty much setting myself up for failure. Not only is everyone familiar with what they’re supposed to look like, but just the nature of the rock face is really hard to paint. After a certain point, I realized that I was free to take artistic liberties with it. I started from the top of the canvass and worked my way down. I liked the way the paint met the canvass on the right side so I thought I’d leave it for a while as I filled up the left side. After completing the left side (and after getting really sick of painting trees) I decided to leave it as is. I tend to make pieces too realistic at times, and I thought it’d be nice to mix realistic with artistic. I thought maybe I’d “finish” it after taking a few weeks away, but after letting it hang on my wall for a month I’ve decided to leave it. 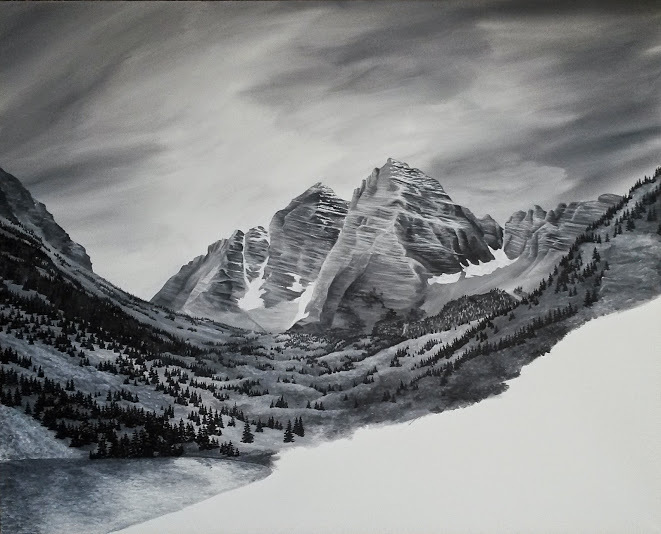 This entry was posted in Across the Divide and tagged acrylic painting, black and white, Colorado, maroon bells, Mountain, painting. Bookmark the permalink. Its a beautfuo painting. I like the sense of lighting. Im glad you put your own artistic touch to it.